X’Tan Ha is located 7.5 miles north of San Pedro Town and has a vibrant and hip beach scene. 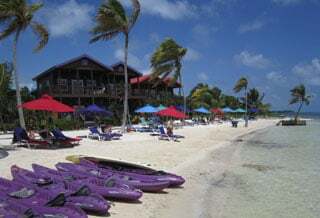 Those of us who live on Ambergris Caye in Belize head to the north island for our beach escape days… We frequent the hidden gems few tourists find–even though it’s fairly easy to reach them. Just hop on a Coastal Express water taxi. The boat trip itself is a thrill…and you’ll get an entirely different view of the island from the water. Water taxis run about every two hours. 1. X’Tan Ha: Ambergris Caye’s Trendiest Beach Scene. The beach scene at X’Tan Ha is vibrant and hip, with a festive feel… The beach seamlessly blends with the resort. This popular beach tends to be busy, though. So arrive early if you want to stake out a comfy chaise lounge. Then settle in for a relaxing, indulgent beach day. The beach is wide, with plenty of soft sand. Coolers float in the water, so you can stash your beer and keep it cool while you lounge in the sea… The beach offers a wide open area to wade and swim, but it never gets that deep. There are a few tables in the water, where you can sit and sip. Or you can buy a cocktail at the restaurant and take it back to your lounger. There’s a volley ball net in the water, as well as water kayaks, paddle boards and paddleboats. The food at the beachside bar is tasty and well prepared. Most lunches run about $15. Choices include salads, wraps, burritos, burgers and other tasty bar food. Mixed drinks run up to $10 for a specialty drink like a Mojito. 2. Tranquility Bay: Secluded Retreat in a World Heritage Site. Tranquility Bay is aptly named. This beach is remote, secluded, and blissfully quiet… There’s no buzz from turbo-prop planes…no motor boat drone…no piped-in music… You’ll hear waves crashing on the Bacalar Chico World Heritage Park here. Tranquility Bay is where people go to be in harmony with the Caribbean Sea, the reef, and the natural environment. The main attractions are the gorgeous beach, the coral beds (a stone’s throw away), and the surrounding Bacalar Chico World Heritage Park. This spot is a snorkeler’s dream. It’s easy to spend hours exploring the coral outcrops, seeking out unusual sea creatures… The water’s shallow–seldom deeper than four feet, and it’s a short swim out to the coral beds. And for scuba divers, the diving outside of the reef is exceptional. Tranquility Bay is located 13.5 miles north of town, twice the distance of X’Tan Ha. Its beach is composed of soft, powdery sand and is blissfully shaded with fringed, swaying palm trees. You’ll find plenty of chaise lounges and hammocks. Not many visitors make it this far north, so the beach is not crowded. This resort is situated within the Bacalar Chico Park, recognized for its unique eco-systems–in the sea, and on the land. This far north the reef drifts towards the beach, eventually colliding with the land. Few boats dare navigate inside the shallow reef. Visitors escape here to enjoy the serene natural environment. Most split their time between snorkeling, swimming, kayaking and relaxing in chaise lounge–under the shade of a palm tree–book in hand. There’s an on-site bar for tropical drinks and you’ll find a decent mix of freshly prepared lunch options at the restaurant. The food is fresh, well prepared, and reasonably priced. Lunches run $8 to $12 and cocktails mainly range from $5 to $8. It’s possible to walk for miles north along the beach. Trails break off into the Bacalar Chico preserve. It’s best to go with a guide if you want to venture into the park–there are native wild animals in this region. Tranquility’s multi-colored cabanas stand on high ground, looking out to sea. You can visit for just the day. But you’ll wish that you’d indulged for a few nights. It will take you about 40 minutes via a water taxi to get to Tranquility Bay. If you plan to come you’ll need to contact the resort to arrange for a pick up at the last water taxi stop, at Blue Reef. The water taxi runs $40 round-trip.